The Quiver Tree Route is a land of contrasts between stark fawn arid land and verdant green vineyards. 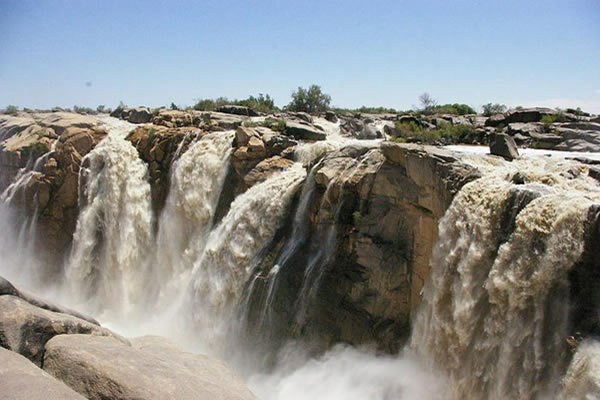 The Great Gariep, known more commonly as the Orange River, winds through the landscape and brings life to the surrounding partched earth. 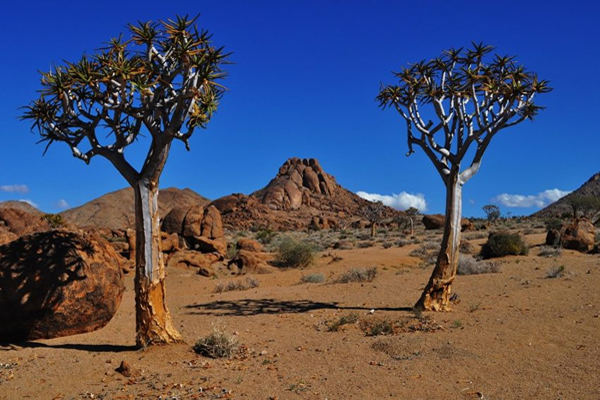 The Kokerboom (Quiver tree) is a botanical symbol of this part of the world. Along the route one can experience dry, rugged mountains, desert adapted animal and plant life and red Kalahari dunes. Twee Rivieren is the Park’s largest rest camp and admin headquarters. It is situated on the banks of the Dry Nossob Riverbed. Activities and facilities are diverse, as are the animals and plants found both within the camp and in the surrounding areas. Twee Rivieren has a reception, shop, fuel, restaurant, information centre and swimming pool. This is the only camp with 24-hour electricity and cell phone reception. 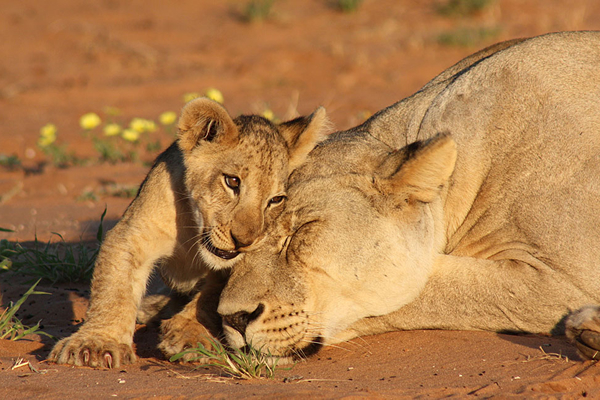 Game-viewing drives and guided walks. 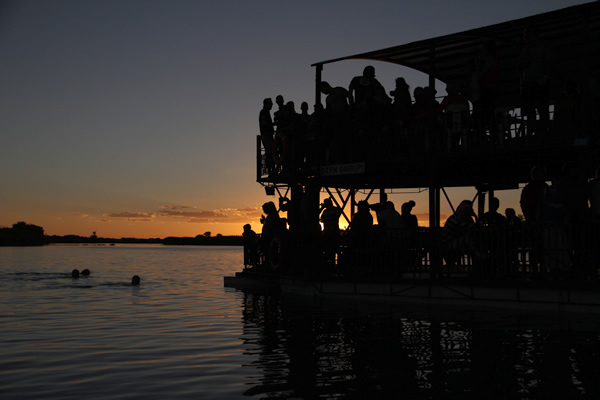 The Orange rivers is majestic and mostly serene and what better way to explore it than to sit back and relax on Sakkies Arkie for a breathtaking sunset river cruise! Enjoy 1½ hours of fantastic birding, total relaxation, good company, good music and soak up the Kalahari sun whilst drifting along the magnificent Orange River. Snacks and alcoholic beverages will be available during the cruise to people above the age of 18 years at our on-board, fully licensed bar. 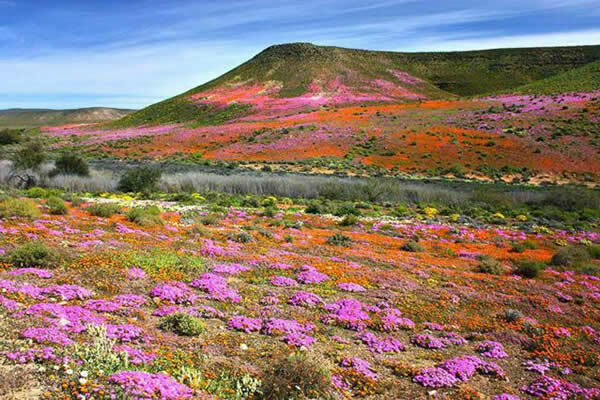 The spring wild flowers are a phenomenon that never ceases to amaze and delight, even for those who live in what is considered South Africa’s “outback” – Namaqualand. What at first glance appears to be a wilderness of semi-desert – arid, dusty plains that stretch before one, dramatic mountains in the background, with little by way of colour or animation – is suddenly transformed, as if by a painter with a manic palette, into a pageant of flowers. 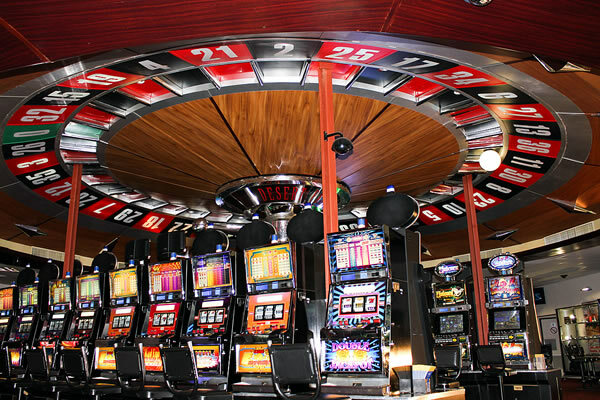 Desert Palace Hotel & Casino Resort situated in the heart of the Kalahari at the Upington Golf Course, 7km from the CBD of Upington on the Kuruman, Vryburg, Johannesburg and Golf Course Road (N14). 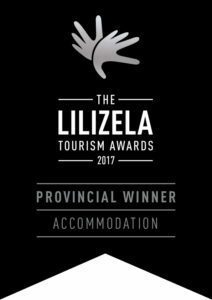 The resort offers a tranquil and relaxed atmosphere with friendly, efficient and well-trained staff whose main priority is you! We will ensure that your needs are fulfilled and that your stay is memorable. Guests can also enjoy our 18 hole Golf Course.